OAKLAND, Calif. -- Mark Canha hit a three-run homer, Jake Smolinski's three-run double highlighted a decisive third inning and the Oakland Athletics beat the Los Angeles Angels 11-5 on Monday in another quirky night at the Coliseum when part of the outfield wall fell down and delayed the game. 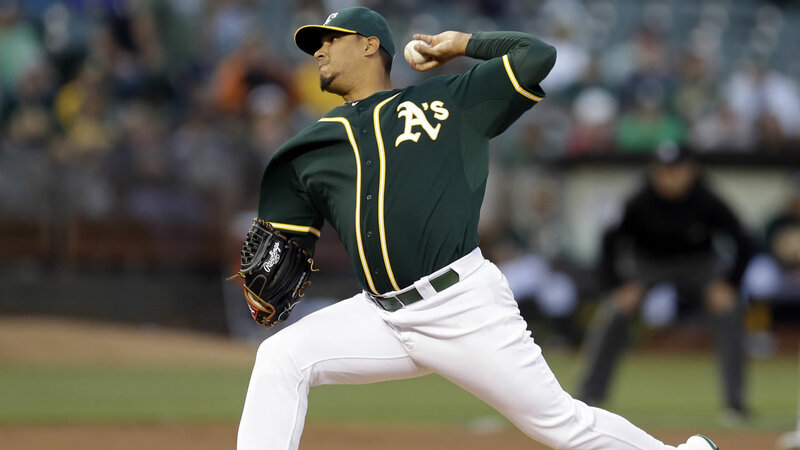 Danny Valencia added a two-run double in the third and another RBI double in the fifth to back Felix Doubront (2-1) in his first win for Oakland. A piece of the outfield wall came loose after Los Angeles left fielder Shane Victorino crashed into it trying to chase down Valencia's double in the fifth, causing a 10-minute delay as players briefly returned to their dugouts. The piece that fell was a middle red panel of an advertising sign. Angels manager Mike Scioscia switched pitchers after the delay. Only hours earlier, the stadium was rapidly transformed back to a baseball diamond after the Oakland Raiders hosted the Arizona Cardinals in an NFL preseason game Sunday night.